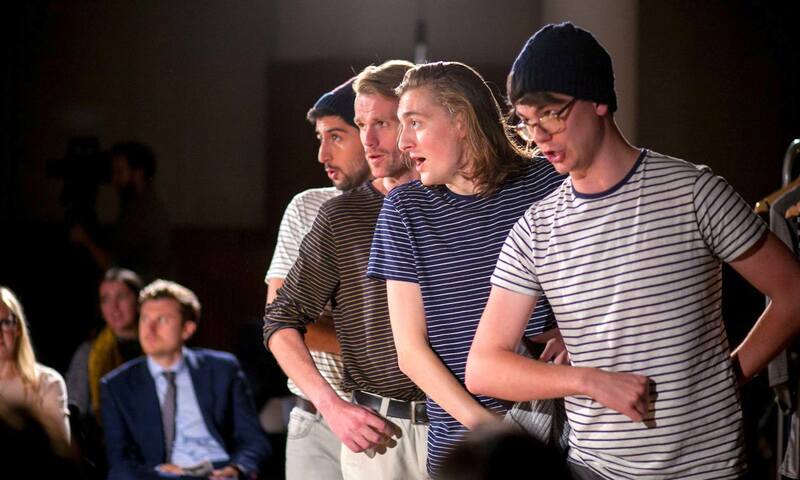 Founded in 2012 by artistic director Ella Marchment, Helios Collective is an opera company that has development and connectivity at its heart. Through innovative and imaginative programming, Helios enables its ever-expanding community of performers, creatives, and arts partners to work together to shape the future of opera. Helios Collective is something to be excited about: our music is in their hands. Among its many critically acclaimed successes, the company has produced a diverse range of sell-out operatic events, including classic, revised, and new operas; masterclasses conducted by world-renowned industry professionals; opera club nights; and opera-plays (plarias). Helios has toured nationally and internationally to leading opera venues, including St Petersburg Philharmonia, Copenhagen Opera Festival, Rose Theatre Kingston, Sage Gateshead, and Buxton Festival. I left feeling that the future of British civilisation is in good hands, larynxes, and batons. The company has also provided continued professional development opportunities to over 1500 artists and commissioned more than ten new operas and plarias. Please subscribe to the Helios Collective mailing list to receive the latest news and updates. Just click on the links below to find out more about Helios Collective’s current and past productions. Ella Marchment’s directing of the piece focuses on bringing out a simple story…discovering the multi layers of it, as opposed to just focusing on one idea. Follow the links below to view photos and videos of Helios Collective’s past productions. Helios Collective would like to thank the thousands of people who have already backed the company with either support in kind, financial donations, or by freely giving their time, knowledge, and expertise to make the company what it is today and what it will be tomorrow. Thank you. Very, very much. Cavalier’s Rock Tosca is basically one of the best ideas anyone has ever had. Big, sweaty, loud and brilliant, rock’s ego-heavy aesthetic is ideal for Puccini’s personality-driven thriller. Ella Marchment’s direction makes the most of this, focusing us on individual characters in turn, keeping the crucial claustrophobic air of persecution in each scene while blasting us with big volume and bigger emotions. It has been an exciting journey for Helios, from the initial opera-scenes concerts in 2013, to the first UK tour of new opera commissions, a series of sold-out opera club nights in London, a tour to Russia, a Stravinsky double bill, two seasons of Formations masterclasses, and critically acclaimed opera productions at The National Portrait Gallery in London, Copenhagen Opera Festival, and Buxton Festival. The Helios team has worked tirelessly to put on some truly amazing, provocative, and thought-provoking productions. Works that the company loves to create, and that its audiences love to watch. In embracing the challenges and opportunities that lie ahead, Helios is currently working to develop more ambitious projects, involving more eclectic partners, and reaching out to ever bigger audiences. There is little doubt that opera is very much alive as a vehicle for young artists, composers and writers. Helios is doing a tremendous job in ensuring that creative souls have an outlet and a platform. And all this is thanks to the energetic leadership of the indefatigable Ella Marchment. Ticket sales make up a very small proportion of the income needed to run a successful opera company, and Helios Collective relies heavily on the generous and enlightened support of its patrons and sponsors to fulfil its work. If you would like an obligation-free copy of Helios’s fundraising pack to find out how you could support the company’s groundbreaking work, please get in touch by clicking here and filling in our online contact form. We’d love to hear from you, and we’d love to welcome you to a Helios Collective production in the future. You can also subscribe to our mailing list by clicking here. The company will be launching a ‘Friends of Helios Collective’ scheme soon. We really do love all of our supporters. If you would like to keep in touch with what Helios Collective is doing in the world of opera, please subscribe to the company’s mailing list using the form below. You’ll receive an email whenever HeliosCollective.org is updated with the company’s latest news. You won’t be hassled or harangued, and your email address won’t be shared with anyone else. If you don’t want to receive messages in the future, you can unsubscribe at any time. Thanks for your interest in Helios Collective. Opera: Helios makes it just for you. Just enter your email address and then select ‘Subscribe’.